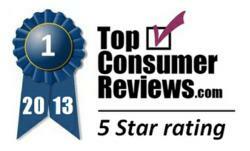 TopConsumerReviews.com recently announced the best home security companies in Arizona for 2013. The team at TopConsumerReviews.com found the greatest amount of customer satisfaction with home security system companies that provide the latest technology, affordable pricing, and a 24 hour monitoring service. TopConsumerReviews.com recently announced the best home security companies in Arizona for 2013. TopConsumerReviews.com provides independent reviews for thousands of products including home security systems in order to help consumers make well informed decisions. Arizona ranks fifth on the list of most violent state in the U.S. In addition, nearly 250,000 property crimes occur annually in the state. The risk of a violent crime or burglary is significant in Arizona. Clearly, safeguarding a home is important to the residents of Arizona for the protection of their families and property. Strategically placed exterior lighting and dead bolts, on all exterior entries, are important security measures to take. However, a home security system is considered one of the most valuable tools in deterring any type of residential crime. The team at TopConsumerReviews.com found the greatest amount of customer satisfaction with home security system companies that provide the latest technology, affordable pricing, and a 24 hour monitoring service. Wireless systems, with minimal installation - especially for apartment dwellers and renters - were identified as the most flexible. In addition, many consumers reported a positive reaction to home security systems with remote access technology, leading the way for frequent travelers, vacation homeowners, and those on-the-go to check the current status of their home, lock a door, or even set the alarm from anywhere in the world. Furthermore, TopConsumerReviews.com identified that, for most consumers, a one size fits all approach to home security systems was not the best method. Choosing a reliable home security company that offers flexible system customization and affordable package options would best meet the needs of each individuals security needs, save money and improve the level of overall satisfaction. To find out more about home security companies, including reviews and comparison rankings, please visit the Home Security Systems category of TopConsumerReviews.com at http://www.topconsumerreviews.com/home-security/. TopConsumerReviews.com, LLC is a leading provider of independent reviews and rankings for thousands of consumer products and services. They offer the latest on Home Security including information, education, and ratings for the best home security systems available today.